Larger text often makes words easier to read on a screen. But larger characters alone don't necessarily make a computer easier to use, if all the icons and navigation elements remain relatively small. Display scaling makes everything on the screen a bit bigger, which makes applications easier to use for people with less than perfect vision. 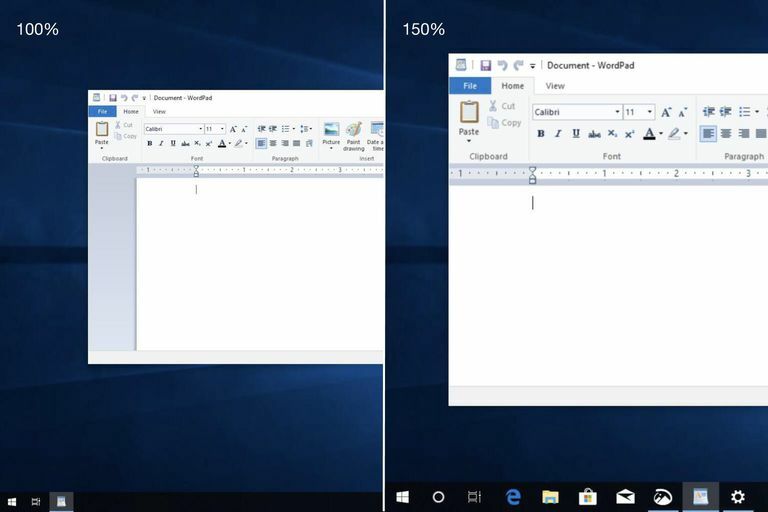 The Windows 10 display scaling system adjusts the size of text, icons, and navigation elements to make a computer easier for people to see and use. You can adjust the display scaling for your Windows 10 device, as well as for any external displays. For example, an adjustment to display scaling can transform a display from one with small text that is difficult to read into a screen that is easier to see. Or, scaling may also make it less challenging to open, run, and use apps on a projected display. The Windows 10 display scaling system selects the size based on a several factors, such as the native display resolution, the dimensions of the screen, and the anticipated distance from the screen. The distance from the screen, for example, assumes that a laptop display will be closer to a viewer’s eyes than an external monitor, and that a projected display will be viewed at an even greater distance. Screen resolution is a separate setting from scaling. See How to Adjust the Screen Resolution Setting in Windows for those steps. To adjust Windows 10 display scaling, requires that you choose a scaling percentage. Here's how. Look for Scale and layout. The scaling and layout drop-down menu will offer recommended scaling options, such as 125% or 150%. Displayed items will appear larger as the scaling increases. Select an option, such as 125% or 150%, then your display will re-size. That's it! Your display should now be scaled to the size you selected. You can adjust display scaling for your main display and connected displays. Place your cursor and click (or tap) on the rectangle for the display you want to scale, such as display 1 or display 2, etc. Then adjust scaling for the selected display. This allows you to adjust scaling for each of display separately. Select Advanced scaling settings to adjust scaling from the standard 100% to as much as 500%. In this setting screen, you may manually enter a custom scaling size. However, different scaling settings will work better on different displays. In some cases, you may see blurry characters, words that are cut off, or text too large or small for a specific space. Older programs, in particular, may not fully support modern Windows 10 display scaling features. The Advanced scaling settings also gives you access to an additional setting that will ”Let Windows try to fix apps so they’re not blurry.” However, this adjustment only applies to your main display, not any external displays. Select the Windows Start Menu. and locate your app in the list of installed applications. Right-click (or, two-finger tap) on the app, choose More, then select Open file location. Locate the application within the files listed, then right-click (or two-finger tap) on the app, select Properties and choose the Compatibility tab. Look for the button labeled “Change high DPI settings”. Here, you can modify scaling settings as necessary. Locate your app in the list of installed applications, then right-click (or, two-finger tap) on the app. Locate the application within the files listed, then right-click (or two-finger tap) on the app. Next, choose the Compatibility tab. Look for the button labeled “Change high DPI settings”. Modify scaling settings as desired or necessary. Your customized display scaling settings will now apply to this application. If you’ve installed custom graphics hardware and software, you might not be able to adjust display scaling within the Windows system settings. Third-party software that controls a graphics card, for example, may take precedence over Windows system display settings. You can often access and adjust third-party graphics software from your Windows system tray (typically found in the lower right corner of your screen). Earlier versions of Windows don’t always adjust scaling as smoothly as Windows 10. Some versions of Windows require you to sign out after you made an adjustment to display scaling settings, then sign back in. Additionally, if you use older programs, you may discover that some applications don’t honor Windows display scaling settings. In either case, it may be time to either upgrade your system to Windows 10 or contact the application developer for assistance.